On Nov. 9, opponents of police brutality from across the country took part in a national day of protest to demand justice for Andy Lopez. Andy was murdered by racist Sonomoa County Sherriffs for carrying a toy gun on Oct. 22. Click here to read more about the case and the historic demonstrations in Santa Rosa. Below are reports from several protests and solidarity actions. 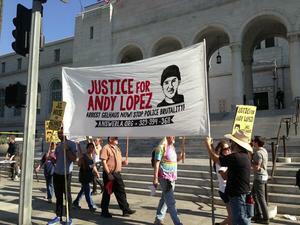 Opponents of police brutality gathered outside Los Angeles City Hall to picket and march on Los Angeles Police Department headquarters in solidarity with the community of Santa Rosa, demanding justice for Andy Lopez. Over half a dozen families who have lost loved ones to police violence in southern California attended the action organized by the ANSWER Coalition. Other organizations represented included WORD (Women Organized to Resist and Defend), Coalition for Community Control of Police and National Brown Berets. Genevieve Huizar, a mother who lost her son to the Anaheim Police Department, said, "We are out here standing in solidarity with the family of Andy Lopez and for all victims of police violence. We know that we have to stand united and fight or these murders will continue every day in communities all over the country." 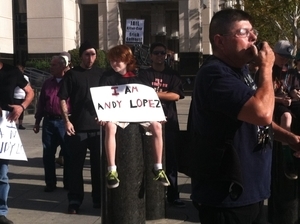 Community members rallied at the Federal Courthouse in Sacramento, Calif., in solidarity with the National Day of Protest for Andy Lopez. The Sacramento rally was organized by members of the Justice for Ernest Duenez Jr. Coalition and activists in the ANSWER Coalition. At the protest, young people from Sacramento spoke about the harassment they face from local cops. Parents spoke about the fear they have for their children in a society where police kill young people of color with impunity. The Sacramento police watched the protest closely from across the street and in hidden positions on levels of a nearby parking garage. A grandfather used a microphone and, in anger from personal police harassment, yelled at the cops, demanding justice. Patricia DeSantis of Santa Rosa joined the protesters in demanding justice for Andy Lopez. Patricia's husband Richard DeSantis was murdered by cops in Sonoma County only blocks from where Lopez was killed. Richard was unarmed and shot dead in front of his daughter and wife. Patricia told news reporters "the system is broken" referring to the corruption not just within the police but with the courts and the whole state system. She is now joining the movement to stop police brutality. 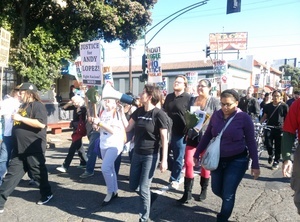 In San Francisco, people gathered at Mission and 24th streets around a banner that read “From the Mission to the Whole Bay Area: Stop Racist Police Brutality.” Many students and families who noticed the action picked up signs provided by the ANSWER Coalition and joined the demonstration to demand justice for Andy Lopez. 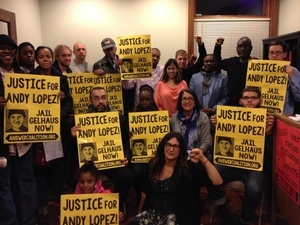 On Nov. 8, activists, organizers and community members gathered to show their solidarity with those struggling for justice in the murder of Andy Lopez. The meeting, held in Washington, D.C.’s, Justice Center, was for the D.C. book launch of Shackled and Chained: Mass Incarceration in Capitalist America. In addition to hearing author Eugene Puryear speak on the contents and implications of the book, attendees had lively discussion and heard reports on the struggle against police brutality in California, in particular the tragic death of Brother Andy Lopez. Not content to end the meeting unless it was on a note of struggle, those attending gathered at the end with signs and raised fists, in a message of solidarity with the national day of action for Andy Lopez that would take place on Nov. 9. 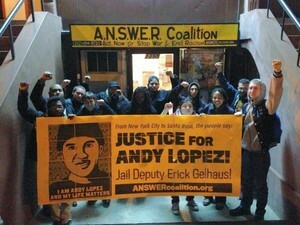 From D.C. to Santa Rosa, the people say: Justice for Andy Lopez!